DBS Bank taps LinkedIn to find its new VP, Regional CBG Marketing, Social Media and New Media within their Consumer Banking Group in Singapore. 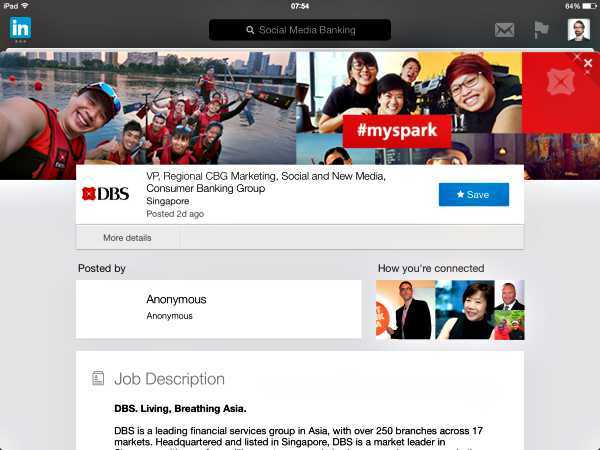 DBS Bank is currently promoting a new Marketing role on LinkedIn: ‘VP, Regional CBG Marketing, Social and New Media, Consumer Banking Group‘. It’s a unique opportunity to join a leader in banking innovation in the ASEAN region and work with the likes of Rob Findlay – SVP Experience Design (@robfindlay) and Neal Cross – Chief Innovation Officer (@Neal_X). We deliver a comprehensive suite of innovative banking services and financial solutions to individuals, ranging from the man-in-the-street to the mass affluent. Providing sound wealth management and financial advisory services, we help our customers make informed decisions about their money and are committed to helping them plan and achieve their life goals. Products and services within the Consumer Banking Group include loans, credit cards, investment and unit trusts, insurance and priority banking. With the focus on Digital as a key strategic priority (conquer mobile, social and date), the Consumer Banking Group Regional Marketing has created a new role to lead the acceleration in usage of Social Media and New Media to our advantage. This new role at DBS Bank confirms that within the last couple of years a deep knowledge of social media, social analytics and big data has become an essential requirement for any senior Marketing hires, even in banking and insurance.